So today marks about three weeks until we leave for Bangkok. Even though we’re six weeks through the placement, it doesn’t mean that I am any more ready for each day. Thailand still manages to surprise me practically daily. Once example today was my G.10 class, they were about twenty minutes late to their lesson. As in all the class. Every single child. I did find it very odd, so I went and asked Ben if I had a lesson. Who knew, they may have a trip I was not told about. Ben told me that they had a blood test, so I got the lesson ready and sat and waited for the students to come back.They came back soon after and I got the class to play matching pairs. I had taught them places in the town and occupations recently, so I had them match the occupation with the work place. They really enjoyed trying to find a match before the other team did. I did find one boy who was writing down where the words were. As much as he was still using his knowledge to match the occupations and workplaces, that would make it far too easy for them! The boys still won in the end. The game took most of the lesson but I still had around ten minutes to introduce some new words to the class before it ended. I think I will make sure to use those words in a game next lesson. 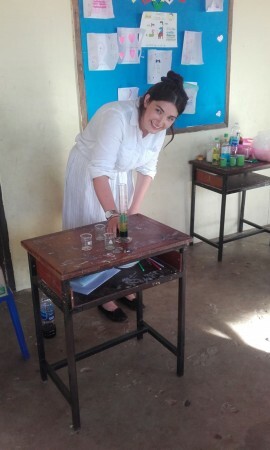 Today we didn’t have English Activity as Eilidh was ill, but we were shown some science experiments instead. 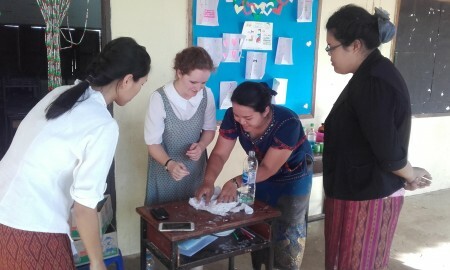 We found out that next week we are going to another school to perform science experiments to schools in Ubon Ratchathani. 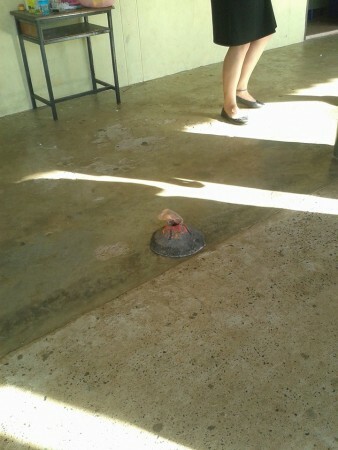 The primary science teacher showed us the experiments and then we chose one and copied. Kate is making ‘Magic Water’ with liquids of different density. Hannah is making a volcano erupt. And I am making artificial snow from a nappy. I’m hoping that we get to practice again before the show as I failed to cut the nappy open properly and Hannah almost blew the paper mache volcano up!